For the first time, the never-before-told history of the Doctor's most dangerous enemy, the Daleks, from their genesis thousands of years ago to their conquest of the universe. 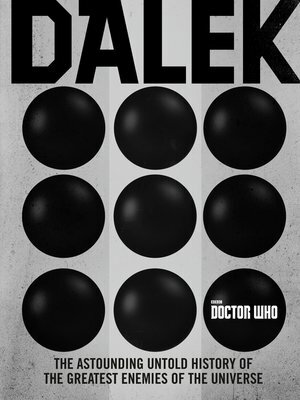 Doctor Who: Dalek, is the one and only volume devoted solely to the history of the Doctor's greatest enemy. The Daleks, with their watchword cry "Exterminate! ", are a race of cyborg aliens single-mindedly determined to conquer the universe and end all life forms they consider inferior. First appearing on Doctor Who in 1963, the Daleks are among the show's most popular villains. Reminiscent of human-sized pepper shakers, the external mechanical casing of the Dalek protects a soft, repulsive creature whose electronic voice is reduced to a squeak when outside of its shell. Doctor Who: Dalek chronicles the Daleks' genesis through the Time War and their ongoing conquest of the universe. Here are never-before-told stories about these legendary creatures—including terrifying near-mythical adventures, startling visual recreations of secret conflicts, and more. Each story sheds new light on what has become the most feared alien race in the universe.